Updated to include 2015 retirement plan contribution limits. As we approach the end of the year, there are any number of things to occupy our thoughts. Holiday shopping and celebrations are at the top of many lists. Fears of the impending Fiscal Cliff may or may not grip your thoughts financially (CNBC thinks that this is so critical that they have taken to posting a Fiscal Cliff countdown clock, journalism or entertainment?). For those of you saving for retirement here are 4 timely and timeless tips. Increase your 401(k) contribution level. Is it your intention to max out your 401(k) for the year (current limits are $18,000 if you are under 50 and $24,000 if you are 50 or over at any time in 2012; these limits will remain the same in 2016)? Check your latest pay stub to see of you are on track, and adjust your withholding if you are running behind. While there is not much time left in 2015, you might be able to have additional amounts withheld from your last couple of 2015 paychecks. Even if your contributions are more modest this is a good time to take stock and see if you might be able to up your salary deferral percentage a bit. Over time even small increases in the amount saved can make a big difference in your ultimate retirement nest egg. I urge you to take a look at your situation heading into 2016 and to consider increasing your deferrals to the extent that you can. Start or fund a retirement plan if you are self-employed. If you don’t have a retirement plan in place for yourself, make 2015 the year to start. Plans to consider are the SEP-IRA, the Solo 401(k), the SIMPLE, or if your business cash flow permits a Cash Balance Pension Plan. Whatever your situation, start a retirement plan for yourself. You work too hard not to reap the benefits. If you have a plan in place, make sure you fund it to the maximum amount possible. Review your retirement plan allocation and your investment choices. Is your 401(k), 403(b), TSP, or similar retirement plan account allocated in a fashion that is consistent with your retirement goals, your timeframe, and your risk tolerance? Does your allocation fit with your overall financial plan and with outside investments (IRA, spouse’s retirement plan, taxable investments, etc.)? This time of year is open enrollment season for the employee benefit plans of many companies. Some companies also use this time to roll out new investment choices for their retirement plans. While you are focused on your benefits, take the time to review your 401(k) and make adjustments. Get a financial plan in place. Planning for retirement is like any journey. If you don’t know where you are headed you likely won’t know when you’ve arrived? How much should you be saving? How should your money be invested? These are among the questions that a financial plan will address. Have you been putting off hiring a financial planner to review your situation? Have you been meaning to do this yourself but haven’t found the time? My suggestion, lose the excuses and get this done. Further if you do hire a professional make sure that this person is a fee-only (not fee-based) advisor who does not have the inherent conflicts that come with need to sell you financial products. Please feel free to contact me with your financial planning and retirement questions. Starting a retirement plan is not as difficult as some would think. 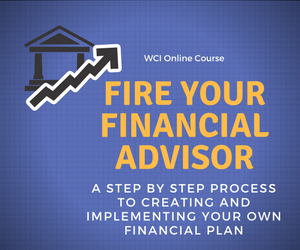 Having an advisor to guide you through the process can make the transition smoother. Thanks for the comment Ornella. There are so many viable options here there really is no reason for the self-employed not to fund some sort of a retirement plan.